When we changed the sails to the High Peak design, the original halyard cleats were replaced with Barton K Cam Cleats. Recently I noticed the halyards were slipping at times and closer inspection revealed that the corner of the cam had worn. This is partly due to the halyard running through the cleat at a slight angle. These are manufactured from a composite Kevlar/Zytal material. Barton claim ... "This advanced material offers performance advantages over carbon fibre and conventional glass-reinforced resins; 'K' cams are very strong, lightweight and have excellent wear-resistance." I looked for other options from Allen and Harken. 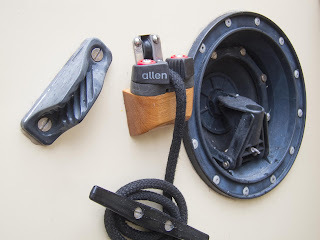 It was interesting to read the information about the Allen range, which is available in two materials. The Allen cleats are available in either Alloy or Allenite. "Allenite is a proprietary material developed by Allen specifically for high wear resistance, low weight and good heat dissipation. 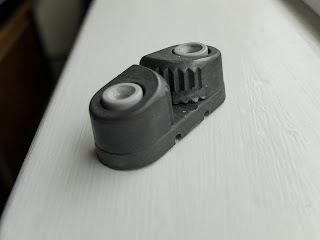 This carbon composite material is ideal for cam cleats"
But Allen admit ... "for ultra-hardwearing applications you can't beat the alloy series cam cleat for strength and durability without shredding your line". Therefore replacements are the alloy version and I'll watch for any wear. However, without realising this difference, the cleat I used for the centreplate is made from "Allenite", so this will need careful monitoring and will need to be replaced if any wear does occur. The line for the centreplate does run through the centre of the cleat and also this line is not pulled through at the same speed/distance of the halyards.